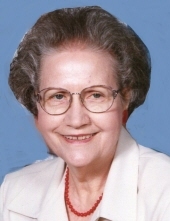 Christine Johnson Beamon, 94, passed away peacefully on Sunday, March 17, 2019 at Brookdale Country Day Road. Christine was born in Wayne County on March 24, 1924 to the late Joseph Dewey Johnson and Mary Ellen Gurley Johnson. She was married to the late Edwin Bernice Beamon. Christine was a member of Union Grove Free Will Baptist Church. The family will receive friends at Seymour Funeral Home from 12:30 – 1:30 p.m. on Saturday, March 23, 2019 followed by a graveside service at 2:00 p.m. in Evergreen Memorial Cemetery. Christine is survived by her daughters, Mary Ellen Fairchild and husband Tom of Greensboro and Abigail Lancaster and husband Michael of Goldsboro; grandson, Cleve Fairchild and wife Astrid Garcia; and a sister, Irene Futrell of Chocowinity. In addition to her husband and parents, she was preceded in death by her daughters, Janie Christine Beamon and Faye Beamon Hare; brother, William D. Johnson; and sisters, Pauline Johnson and Ruby Beamon. To send flowers or a remembrance gift to the family of Christine Johnson Beamon, please visit our Tribute Store. "Email Address" would like to share the life celebration of Christine Johnson Beamon. Click on the "link" to go to share a favorite memory or leave a condolence message for the family.